The year is 2047. An extinction-level asteroid is hurtling toward Earth, and the descendents of ancient Atlantis have returned from the stars in their silver ships to offer humanity help. But there’s a catch. They can only take a tiny percent of the Earth’s population back to the colony planet Atlantis. And in order to be chosen, you must be a teen, you must be bright, talented, and athletic, and you must Qualify. Sixteen-year-old Gwenevere Lark is determined not only to Qualify but to rescue her entire family. Because there’s a loophole. 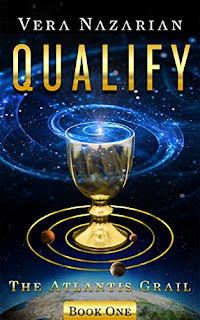 If you are good enough to Qualify, you are eligible to compete in the brutal games of the Atlantis Grail, which grants all winners the laurels, high tech luxuries, and full privileges of Atlantis Citizenship. And if you are in the Top Ten, then all your wildest wishes are granted… Such as curing your mother’s cancer. There is only one problem. Gwen Lark is known as a klutz and a nerd. While she’s a hotshot in classics, history, science, and languages, the closest she’s come to sports is a backyard pool and a skateboard. This time she is in over her head, and in for a fight of her life, against impossible odds and world-class competition—including Logan Sangre, the most amazing guy in her class, the one she’s been crushing on, and who doesn’t seem to know she exists. Because every other teen on Earth has the same idea. You Qualify or you die. It's a miracle Jimmy Wayne survived his growing-up years. Hungry, homeless, and bouncing in and out of the foster care system, Jimmy spent more nights wandering and sleeping in the streets than he cares to remember. His father left before he was born. And his mama, when she wasn't in a mental hospital or behind bars for various small offenses, was simply too overwhelmed, trying to survive herself. 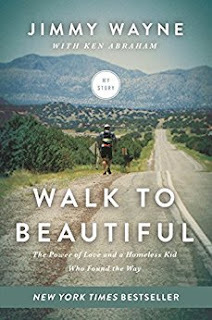 This is the powerfully emotive account of Jimmy's childhood and the unconditional love and acceptance Russell and Bea Costner gave to Jimmy. This elderly couple provided a stable home and the chance for him to complete his education. Jimmy says of Bea, "She changed every cell in my body." After his high school graduation, Jimmy went on to earn a degree in Criminal Justice because, as he says, "I knew a lot about it." But in his heart Jimmy wanted to write songs and sing. A music company opened its doors to Jimmy, and he moved to Nashville to pursue his dreams. He had several memorable hits, such as I Love You This Much, Paper Angels, and Do You Believe Me Now?, which remained at #1 for three consecutive weeks on the Billboard Chart. But success was not satisfying. Jimmy remembered where he came from, and he wanted to give back. With his Meet Me Halfway campaign—a 1,700 mile walk from Nashville to Phoenix—Jimmy walked halfway across America, raising awareness for foster children. Along the way he not only found a lot of crazy things, such as coins, keys, a plastic Jesus, and a Lucille Ball ashtray; but he also found himself. And more important, he found a way to forgive the people who had hurt him. Jimmy learned how to walk to beautiful—and so can you.